Reflect solar energy to improve indoor comfort year round. Nothing adds life to your interior space more than great natural light from the sun, but with sunlight comes unwanted heat, hotspots and glare, which can really affect your overall comfort and make for a less inviting environment. 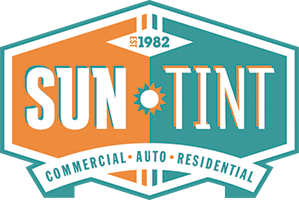 Sun Tint films can reject heat coming into your home by blocking infrared heat energy or small portions of the visible light spectrum, thus providing you with greater temperature stability, comfort and glare control. Shield against ultraviolet (UV) rays that cause skin cancer and damage interior finishes and furnishings. Even inside a home or building, you, your family and your belongings are exposed to sun damage. UV rays cause fading and irreparable damage to your furniture, flooring, photographs, artwork and window treatments. And, most importantly, your skin is at risk as well. Many people think of this risk only when they’re outdoors but the truth is energy from the sun can be harmful and it easily enters our interior spaces. Window tint installed by Sun Tint will help a great deal by filtering visible light, rejecting solar heat and blocking over 99% of harmful UV light. This significantly reduces the sun’s damage potential and protects what you treasure most. For more information about skin cancer, visit the Skin Cancer Foundation website. Enhance the aesthetics of a house or building and provides privacy. Because window film comes in a variety of shades, color tones, finishes & designs, it can maintain your view while providing protection, improve the look of a structure, simply blend into the architecture and design, or provide a uniform look by disguising the view into the structure’s interior. Sun Tint can supply you with many fantastic ideas to match your space. Protect your home or business from physical intrusion and safeguard against broken glass hazards. Any type of window film (ie: solar control, decorative or privacy) when applied properly by Sun Tint will hinder admittance into your home via the windows. The plastic quality of window film simply holds broken glass together against relatively tough force. However, if you require stronger, more specialized protection, safety and security films are designed specifically for this purpose. These films offer defense against theft, protect your home from severe weather, ease the effects of blast fragmentation, and provide peace of mind, as you know that you’re taking the extra step to keep your loved ones and property safe. The films are available in varied degrees of thickness and can attach using a number of different methods, so there’s bound to be a customized solution that’s right for you. Please contact Sun Tint for more exact, individual recommendations. Provide outstanding energy savings in the form of lower utility bills and a smaller carbon footprint. In this day and age, people are interested more than ever in helping our environment and preserving our precious resources. You can make a significant difference in your everyday life simply by reducing your air conditioning usage. Sun Tint can help you do just that by installing window tint thereby rejecting heat and keeping interior temperatures more controllable and stable. By running your air conditioning less, you’ll consume less energy, reduce your carbon footprint and save money on utilities. Sun Tint offers the first and only line of window tint for residential applications with an “Environmental Product Declaration” (EPD) and “Climate Declaration”. The EPD reports on the films’ full environmental impact and proves scientifically that these films have a net positive environmental impact worldwide. The Climate Declaration finds the films to be carbon negative, meaning their use saves more carbon than is required to make and dispose of the films. Defend against electronic intrusion. Theft of electronic information is a concerning modern day threat. Electronic equipment found in just about every business and home such as wireless networks, laptops, PDAs, cell phones, etc. are vulnerable to hi-tech attack through the windows. Because the electromagnetic fields generated by this equipment can easily pass through glass, tech savvy criminals can break into these systems and rob them of personal information like credit card numbers, bank information and other key financial data. To prevent this, Sun Tint can install certain window films with a layer of transparent metal to act as a barrier against electromagnetic interference (EMI), thus keeping your information secure. Interested in learning more? Contact a Sun Tint professional today and learn what residential window film can do for your home!